NEW this year....fiber optic Internet!! Ocean breezes flow through this spacious home. Surrounded by trees, this house sits on the first bluff above the Pacific Ocean; it is an easy 10 to 15 minute walk to the beach and another short walk to town center. There you will find a fresh vegetable market, grocery stores, many restaurants, and tour guides. The bedrooms at Casa Limon Dulce are large; two king and one queen. Each bedroom has individual air conditioning or transom ventilation, and plenty of space for reading, writing, or that necessary quiet time. A small library contains a writing desk and a comfortable day-bed. The over-size kitchen has a large mahogany center island to gather around. At one end of the island is a five burner stainless steel stove with a griddle and warming drawer. All the water for the house is triple filtered town water. The ice maker makes lots of crystal clear ice. There is over 18 feet of countertop for food preparation and two side-by-side stainless steel dishwashers for easy cleanup. There are two full baths with extra large showers. One bath has a stacked washer dryer unit for your personal use. 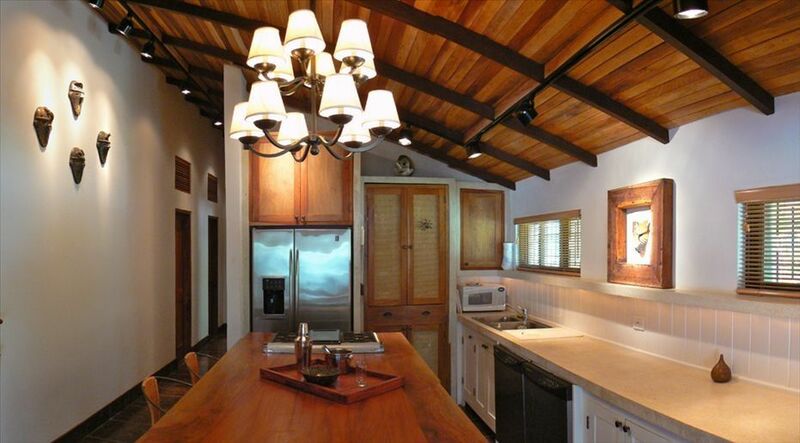 This architect designed house was finished in 2008 using local exotic Costa Rican woods and floor tile. The open-air living and dining area is a wonderful place to relax. It overlooks the large terrace and mosaic tile pool. The pool is one of the largest in the area. A real swimming pool!! An onsite private massage studio is available to residents who utilize our associated therapist. A bilingual caretaker manages the property and can offer whatever service level you require. Our housekeeper is included to assist in your stay. An infra-red security system is provided for your comfort. This is a very special house, minutes from town, up a quiet country road, in the heart of Costa Rica's natural beauty. For more details, photos, and a video of the property see the dashboard above. free for in country calls -long distance requires a Costa Rican phone card available easily at grocery stores. Includes sofa, Costa Rican rockers, and a hammock! 4 burner plus center gas griddle and warming drawer. There is also a vegetable juicer, citrus juicer,toaster oven, food processor, rice cooker, toaster, coffee maker, blender, slow cooker, etc. Dining buffet contains place mats, cloth coasters, cotton napkins and a hammock for the rancho. Includes mangoes, papayas, and limes in season. Lots of flowers and palms with fresh coconut water....ask the gardener! We had an amazing time! The house is beautiful, well equipped and spacious. Throughly enjoyed the outdoor living space, pool and wild life. Will definitely be back! Also, I highly recommend Gerado for the taxi service and for info on things to do in Samara. He speaks fluent English and made our trip so much more enjoyable! We enjoyed our stay at Casa Limon Dulce. A lovely comfortable home in a good location near the beaches and town of Samara. We liked the openess of the home with ceiling fans and interesting and tasteful decor. The kitchen is fully stocked with everything you need to cook and prepare meals. We loved the pool and patio area where we could view and hear lots of birds and greet the iguanas, coati, and pretty squirrel. We didn't have any Howler monkeys as guests , but heard them all around us. Gerardo, the caretaker, and Desi who cleaned everyday during the week were so friendly and helpful. We would like to return. Gerardo and Desi commented that you were kind, peaceful folks! And we would all love your return! This is our 4th stay at Casa Limon Dulce, and we still love it. It’s close to town but just far enough to be quiet at night. Wildlife sightings, great living space, comfy beds, and the host (Rich) and house manager (Gerardo) are always fantastic to work with. Highly recommend! And your visits are always welcomed! We feel like you are a “house family friend“. Hope to see you again soon. This is a beautiful spot. Lap of luxury! Great for families. We had a great time. The location is good. You need a car. The beaches north of Samara are definitely worthy trip and the snorkelling with Xavi was a highlight. The house has everything you need. Loved it here. Monkeys, iguanas, birds all in the back yard with the hammock, swing and pool! It is so easy to be a “fun family” in Casa Limon Dulce. Hope you guys visit again! We stayed here for a week after Christmas and it was a great vacation house. The indoor/outdoor concept was excellent and we enjoyed being able to open everything up and take in the great weather. The kids spent a lot of time in the hammock and on the swing. Gerardo set us up with a fantastic kayak tour and Desi was a really nice housekeeper. We also enjoyed all the wildlife-the iguanas (jessica) were around every day. Would highly recommend this house! Horseback tours can begin from the house up into the mountains or down to the beach,a canopy tour zip-line is nearby, a multitude of Costa Rican activities and tours are available in town.